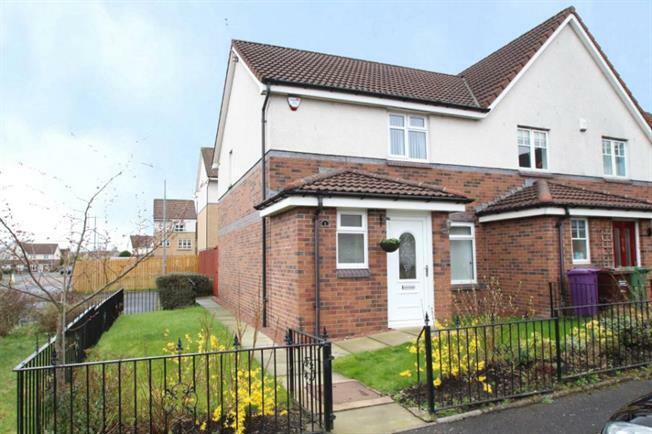 2 Bedroom End of Terrace House For Sale in Glasgow for Offers Over £115,000. A very well presented and well maintained two bedroom end terrace home built circa 2001 by Wimpy Homes. Set in a small residential cul de sac and enjoying a secluded rear garden and patio. Accommodation comprises entrance hallway with access to ground floor WC, south west facing lounge with large double glazed window and under stair storage. There is open access through to a generous dining sized kitchen with double glazed window and French door leading to the garden. The kitchen area is fully fitted with ample work surfaces, four ring gas hob, electric oven and grill below. There is space and plumbing for washing machine, dishwasher and full height fridge/freezer. There is also a separate dining area. On the first floor the landing gives access to the loft storage, two bedrooms and a family bathroom. The bathroom has a modern white three piece suite with a mains fitted power shower, low flush WC and wash hand basin. Features of the property include gas fired central heating and double glazed windows. Outside the property to the rear there is a well presented and well laid out private garden with a paved patio area. To the front of the property there is a small private front garden along with off street car parking in cul de sac to the front. Local amenities can be found on the nearby Maryhill Road, Great Western Road and Byres Road all of which offer a wide selection of bars, bistros and restaurants. The location offers excellent transport links including bus, rail and underground. There are good road links to the Clyde Tunnel, Clydeside Expressway and M8 motorway network.